Hmm...Let's see....What do we have for dessert today? It looks like something with nuts and smells so sweet...Oh, it's baklava!!! 1. To make the syrup, place the sugar and water in a small saucepan. Stir over a medium heat until sugar is dissolved. Bring to the boil. Add ground cardamon. Reduce heat and simmer for 5 minutes. Remove from heat and cool it completely. 2. Grease of a 20 x 30 cm baking tray. 3. Combine all nuts, sugar and cardamon in a bowl. 4. Preheat oven to 140°C fan. 5. Combine all ingredients of the dough in a large bowl and knead it until the dough is well smooth. Then divide it into 10 pieces. Two of them have to be a little bit bigger than the rest. Roll all the pieces of the dough into ball shapes. Cover them with a plastic wrap while working with 1 ball at a time. Take one big ball; roll it on lightly floured surface until approximately a 20 x 30 cm sheet. Place it carefully in greased baking tray, adapt to tray. Brush the sheet lightly with melted butter. Roll one small ball in a 20 x 30 sheet. Place it on the greased (first) sheet in the tray. Brush the surface with butter and spread about ¼ cup of filling evenly over. Repeat with remaining balls up to last big ball. Do not brush and spread the last sheet!!! Outline rhombus forms on the surface of last sheet. Then cut them into rhombus shapes. Brush tops of cut rhombus forms with lightly whipped egg. On the middle of each rhombus form stick almond kernels. Bake for 15 minutes until lightly golden brown. Reduce temperature to 120°C fan and continue baking for 20 minutes. 6. As soon as the Pakhlava comes out of the oven, pour the cold syrup over it and place the Pakhlava in the turned off oven again for 5 minutes. Cool it completely in the tray. 7. 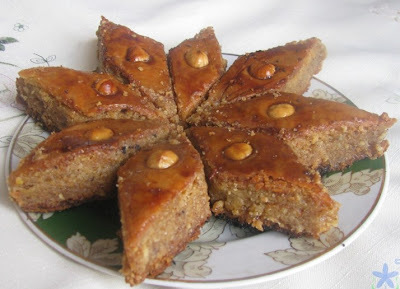 Enjoy the Pakhlava with a cup of tea with lemon. Stay tuned with Not a Zebra!! !